When filming aircraft demonstration flights/airshows, it's hard to know where the aircraft will be and even when you acquire it with your naked eyes, you can lose it quickly while trying to get it in your camera's viewfinder. 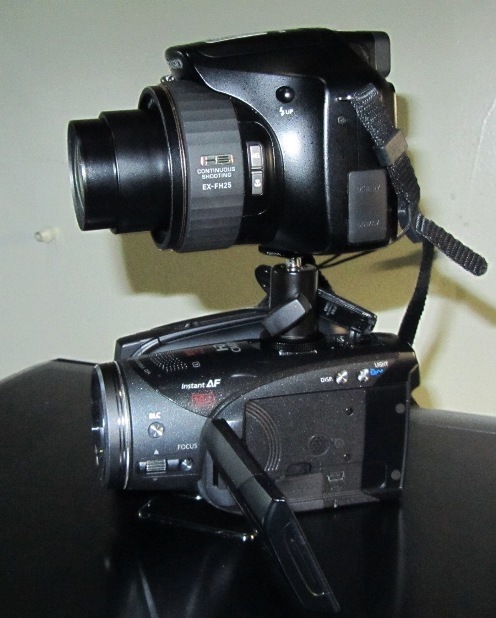 I got an adapter and connected two cameras together. 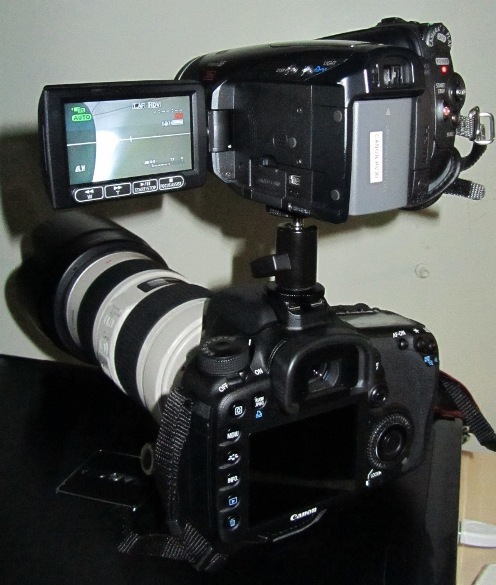 This arrangement allows me to record video at two different zoom settings simultaneously. I have used the Canon HV30 joined to a Casio Exilim twice while filming aircraft. It works good, but getting both cameras aligned properly was a little tedious. Haven't tried it with the Canon 7D yet, but I think it would be alright, and I could quickly switch from stills to video. The Casio is the one with the hi-speed feature so it will play back in standard def at 4 times slower than real time. It can be set up to shoot normal 30fps Hi-def and at the push of a button, go to 120fps. The connecting adapter was only about $5.00. You may find that the framing of your wide shots appears un-natural when you harmonise the centre of both images for tracking. My personal preference and this is just me, not a qualified operator speaking, is to frame the wide camera as high as I can and still have useful tracking for the long camera and also for the wide camera to be framed so that there is noseroom for passes from one side to the other. This means that aircraft travelling the other way are in the leading portion of the frame and have less noseroom. If the aircraft have smoke, then the composition changes, noseroom for one direction and the smoketrail fiulling the shot when following in the reserve direction. If your shot is wide enough to bring in the ground, then the continuous follows begin to look rather amateur in the wide view. If I am covering take-offs from a diagonal viewpoint relative to the runway, I try to keep the angle as acute as I can. There is a trade-off in that the more acute the angle the less you are able to cover the passes entirely as an overhead component becomes increasingly built in. I also set up the noseroom in the wide shot to suit the direction of travel. It is at best a compromise framing and becomes more so, the wider your view is. Ideally you would have a third camera for a near-to-fixed wide view for the smoke trails, the terrain and the backs of people's heads. You want human behaviour at some point. That means a second operator, which may be a luxury not for you. My personal preference is for a side-by-side mounting of the cameras with the aquiring camera offset to the left of tripod centre. This allows more more walkspace and for the aquiring camera viewfinder to be also as close to centre of the tripod head tilt pivot so that you are not crouching and ducking under or craning to get at the viewfinder when the tilt angle changes. Depending on how well tuned I am to the day's program and the figures display pilots will fly, I attempt to go off the long shot and compose the wide shot correctly, allow moments of no camera-movement so the aircraft does all the work, especially if it has smoke I can follow back to the aircraft with the long camera. This is risky, depending on how competent one becomes in re-aquiring the long view. The wishlist. - One day, some clever little guy in Dongguan replicates in small scale, the Phalanx missile target following system for aviation video enthusiasts at an affordable price. Pigs might have been granted their certificates of airworthiness before that happens. Enjoy your event and the ride. I can only sit here envious and jealous. In your camera position in the Mitchell, you will be riding a piece of movie history. I have just realised I have been repeating myself from an earlier post. Please forgive. Andy. Thanks for the Duxford link. I stopped by my local airshow on Sun and shot some clips of Canadian snowbirds. With only T2i kit lens and planes moving at the speed of sound, sometimes as close as 200 ft away, getting subject focused was a bit difficult. But I think the result was more than acceptable.